Day Two of vacation proved as good as the first, with stellar weather matched by genuine conviviality. Dining al fresco with no mosquitoes is a luxury anyone east of the Rockies revels in. 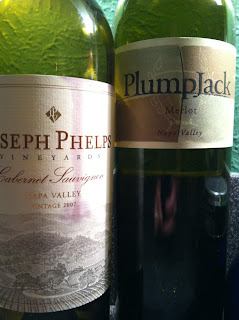 Local, grass-fed steaks on the grill met two worthy companions: 2007 Joseph Phelps Cabernet and 2008 PlumpJack Merlot. Both were refined examples of Napa and their respective varieties, if way too young to enjoy this early in their evolution. In my experience, most better Northern California Cabernets from 2007 are still in their infancy. Patience will be rewarded, though. Between visits, exploring, and (mild) hiking, we managed to put away an obscene amount of wine. But of all the terrific wine we had on the trip, the most enjoyable, without question, was the 06 Robert Mondavi Cabernet Reserve. Decanted for four or so hours, it opened into a seductive splendor that stopped conversation more than once. While it was certainly the most expensive wine we had on the trip ($135), it also delivered the most dollar-for-dollar drinking enjoyment. Simply sublime. Fatty Colorado lamb chops rubbed and grilled pushed the Saturday night meal over the edge into gastronomic ecstasy. Thank you Paxton, Heather, and Beckett! Honorable mention goes to the 2008 Veramonte Primus red blend that, at $16-ish and having been open for four days, was still full of eye-popping pizzaz. Vacation is over and already missed, but getting back to the grind is made easier knowing that the companionable calm of the holiday mindset is only a cork's pull away. Whatever you're drinking tonight, here's hoping it transports you to your mountain, beach, city park, or other zen vacation place.